SageGlass controls sunlight to help patients heal faster, maintain views of charming countryside. 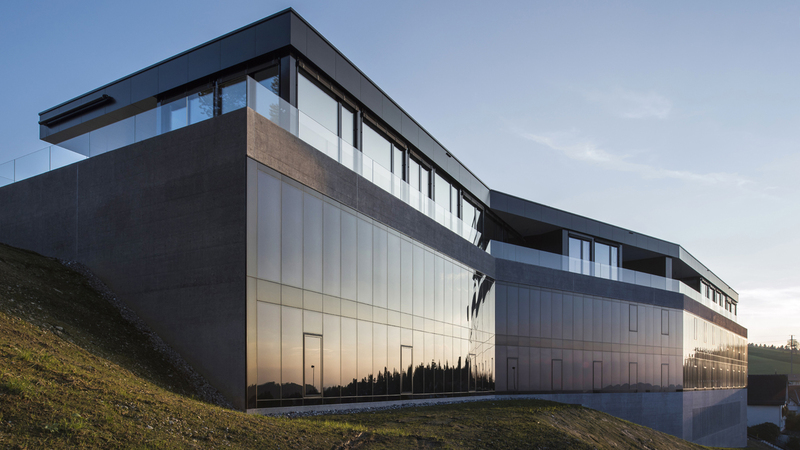 SageGlass®, the pioneer of the world’s smartest electrochromic glass, installed 4,844 square feet of dynamic glass on the floor-to-ceiling façade of the new 263,715-square-foot Bellavista Eye Clinic in Speicher, Switzerland. SageGlass, a product of Saint-Gobain, was chosen for its ability to provide access to natural daylight, which has been proven to be a major contributing factor to the patient recovery process. Extensive research has shown how light affects a patient’s wellbeing and how access to natural daylight has both a significant biological and emotional impact on humans. In the case of the eye, the retina has not only a surface on which surrounding views are projected, but also cells that dictate a human’s biological clock. By providing patients with access to natural daylight, SageGlass will help to strengthen patients’ biorhythm, promoting overall health and wellbeing as well as boosting patient vitality and quality of life. SageGlass can also be controlled manually to darken and clear on demand for patients with sensitive eyes. Along with providing access to natural daylight, SageGlass helped the architects, Carlos Martinez Architekten and Berneck SG/CH, meet their aesthetic vision by allowing the façade to follow the curve of their design, giving the building an overall feeling of lightness and fluidity. Unlike blinds or shades, SageGlass allowed the clinic to maintain its connection to the surrounding charming countryside. The new Bellavista Eye Clinic, which is located next to the well-known Bent Clinic, consists of 28 beds and two operating rooms, and was designed in partnership with architects Carlos Martinez Architekten and Berneck SG/CH; metal and façade construction company Krapf AG in Engelburg; and overall contractor HRS Real Estate in St. Gallen. SageGlass® is the pioneer of the world’s smartest electrochromic glass and is transforming the indoor experience for people by connecting the built and natural environments. Electronically tintable SageGlass, a product of Saint-Gobain, dynamically optimizes daylight and manages temperature – all while maintaining unobstructed views of the outdoors. With SageGlass, building occupants can comfortably experience the biophilic benefits of the outdoors, including stress reduction, enhanced creativity and an improved sense of wellbeing. Unlike conventional sun controls, such as mechanical window shades or blinds, SageGlass allows architects to elegantly solve solar control challenges without sacrificing aesthetics and design. As a wholly owned subsidiary of Saint-Gobain, SageGlass is backed by more than 350 years of building science expertise that only the world leader in sustainable environments can provide. Ready to look again? Visit www.SageGlass.com, @Sage_Glass on Twitter and Facebook.com/SageGlass.